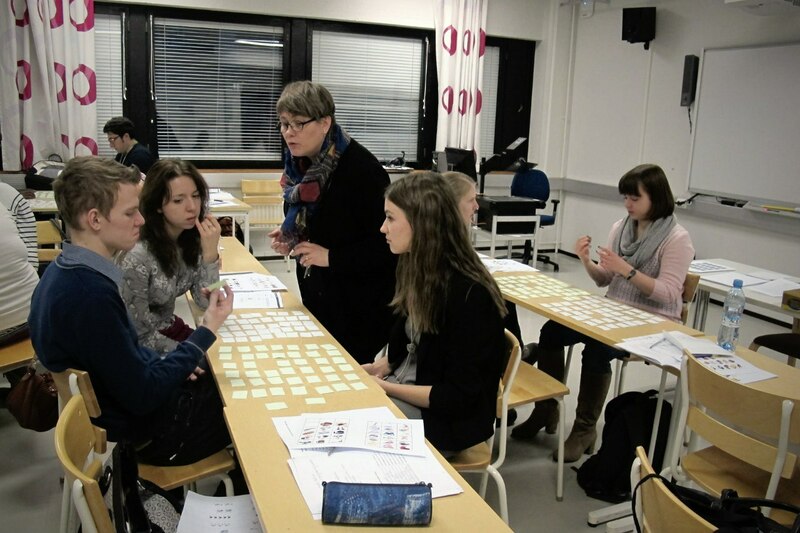 Aisulu Harjula 24.2.2014 Events, General, Studying 6 Comments on Skills from the beginning: Finnish 1. Suomen tunti! 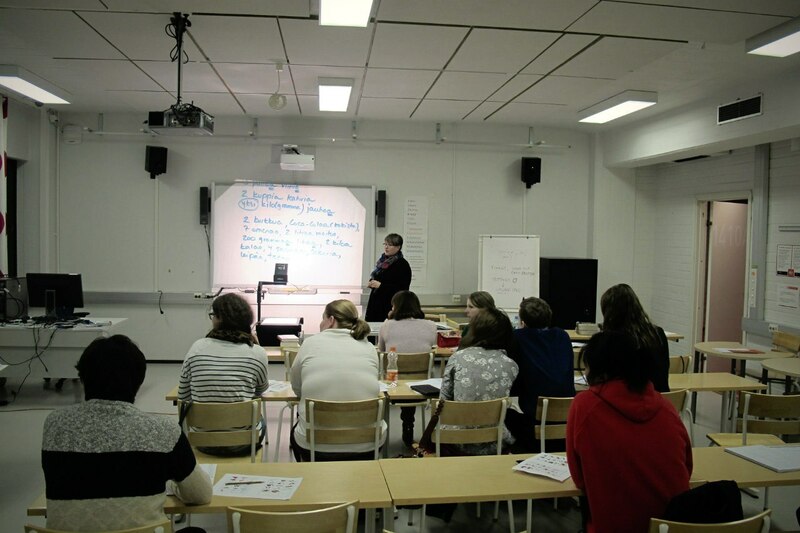 I’m going to write about practicing Finnish language and experience attending the class. Every international student in Finland can start studying language as part of integration process aimed to reduce culture shock. How to feel yourself not being lost? 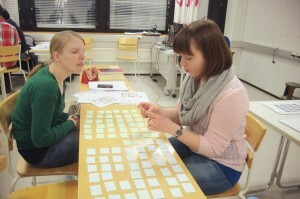 Start learning Finnish, and it will make life in Suomi easier. “In my opinion language allows me being polite by using words like “kiitos”, “ole hyvä”, “hei!”, “huomenta”, “anteeksi” and so on. Finns know that their language is difficult, and by that I can show I’m willing to learn it” says Ronja Baden, an exchange Master’s student from Germany. “I prefer to follow the principle “When in Rome, do as Romans do.” Language is a part of culture, and I hope that Finnish knowledge will help me to understand Finns better” says Ekaterina Pavlova, exchange student in business administration. Our great teacher Kristiina Karjalainen who has 2 years of experience in teaching international students gave nice interview about language. 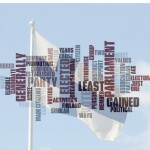 – Is it hard to make people know Finnish? How good do usually students progress based on previous exams? 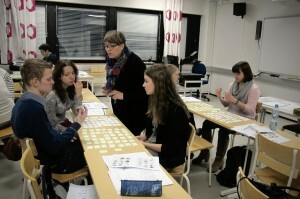 – It’s not really very hard as we start the basics and most of the students don’t have any Finnish background at all. 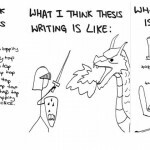 Of course sometimes it can make process of learning more difficult. But most of our students pass the exam well. 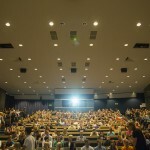 It means that those who get good results attend classes and study hard. 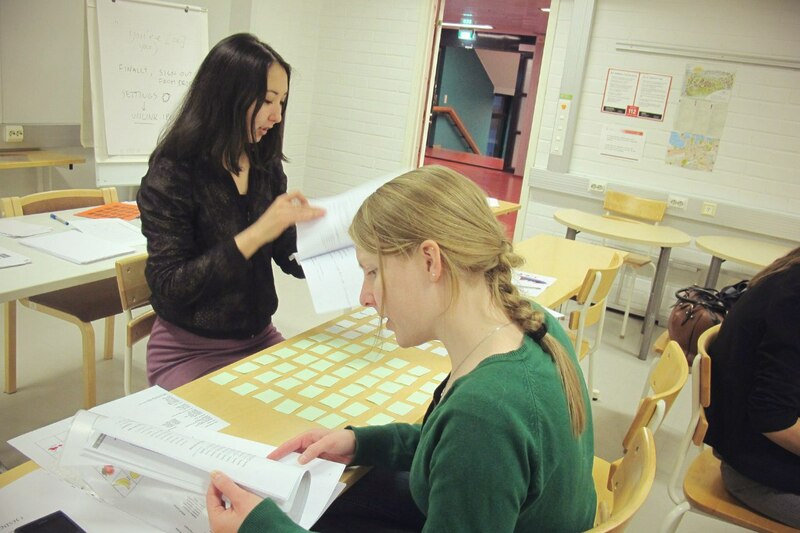 Seven weeks is just a very short time to learn a new language that’s why we recommend students to take Finnish 2 course even if it is not compulsory. 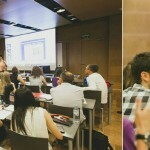 – What are the main challenges for beginners and for those who have achieved intermediate level? – In the beginning the most difficult thing is the new vocabulary because you can’t compare new Finnish words with other languages. Another thing is grammatical system: if you come from an Indo-European language area (English, German, etc.) or from Romanic language area the syntax (grammar) is totally different, and it might cause problems. Intermediate level students sometimes find the case system and the verb conjugation overwhelming. But with the practice and usage many people can overcome this difficulty. Photos: it’s easy to memorize new vocabulary when practicing in game! – Are there any the specific issues in Finnish language that don’t exist in other languages? – Well, there are some things which don’t exist in other languages (cases, verb conjugation) but there are similar words in Estonian, Karelian and other languages of Finno-Ugric group but there are also quite many words that only we have. Languages tend to change over time being influenced outside so even within the Finno-Ugric language group there are differences in vocabulary and grammar. What do students think about learning process? 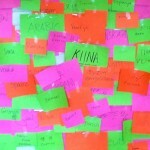 Everything is unknown in the beginning: names of food in supermarkets, streets and districts and even direction signs. Fortunately, in the cities close to the border there are plenty of signs in English and Russian. But inside the student campuses most of useful information such as ads, newspapers social prospects and brochures are in Finnish. In my opinion knowledge of Finnish makes life much easier although everyone speaks English here. But with new knowledge something that was unknown before becomes understandable. 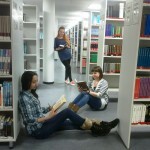 And exam of Finnish language is an estimation of own understanding of Finnish and its grammar. Although I have been to Finland a lot of times before, it’s totally different experience to live here. And it seems to be more difficult for me to deal with everyday life without knowing the language. I feel helpless if I can’t talk to sellers in the supermarket or drivers in the bus (they might not always know English), and I feel happy if I can greet or thank people in their mother tongue. 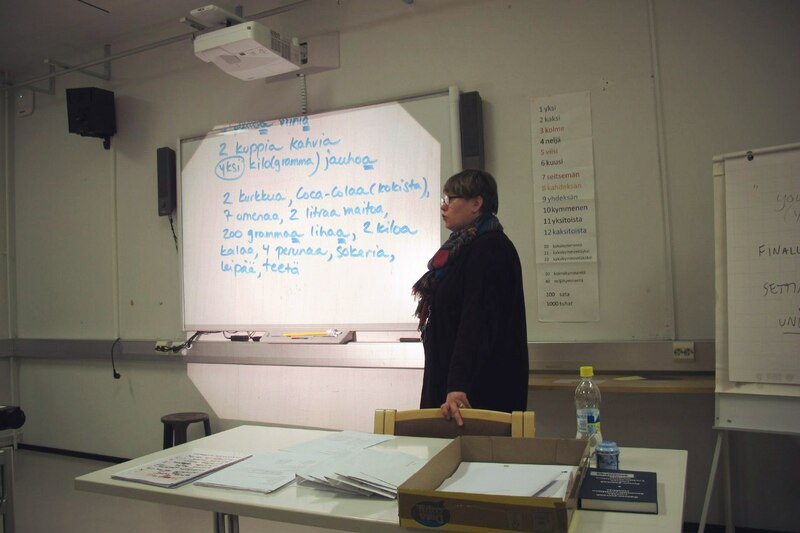 And thanks to our amazing Finnish teacher Kristiina Karjalainen the process of learning of one of the most difficult languages became an adventure. Finnish language helps me to understand some locals (at least shop assistants :D) and just explore the nation because when you learn the language you understand some cultural cues. A friend of mine decided to attend Finnish courses, so did I. It’s really a good idea to learn Finnish staying in Finland because the process goes faster. Moreover, it’s easier to live in foreign city when you know the language, even just if it’s some words. I would be glad to take Finnish again but I’m leaving Finland in March. I think Finland is country with beautiful nature, with reindeers, huskies and frozen lakes. Especially, Lappeenranta looks like city built exactly in the middle of a forest. Finnish language helps me mainly in grocery. Nowadays, I know what I buy and how much it costs together 😀 and I feel relaxed even before exam because of very good teaching techniques. 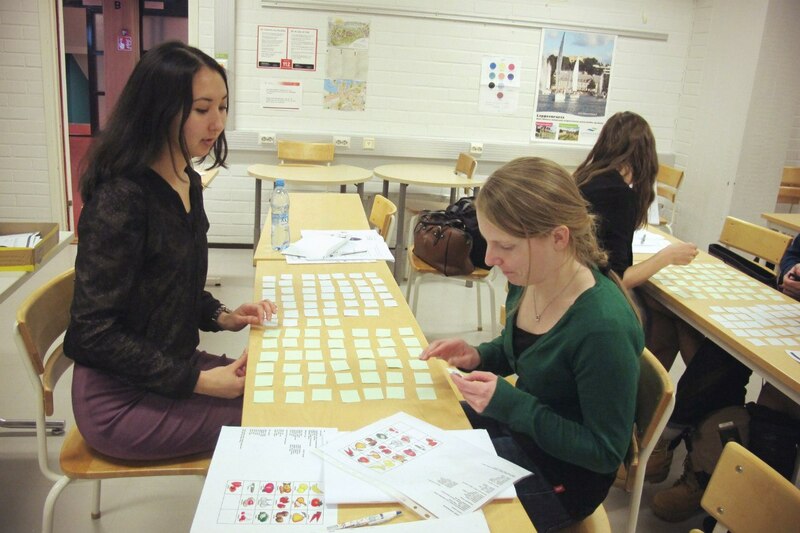 For example we played a memory game to remember fruits, vegetables, dairy products and so on. 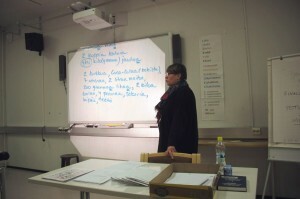 I would like to take intermediate Finnish course as well. I use my treasury of Finnish words in shops, in the cafeteria, library and so on to be friendly. Lappenranta is is like a large village for me who lives in one million population huge city . But I appreciate this silence and fresh air. Some of sellers speak poor English or only Finnish language. That’s why I decided to get the basics of Finnish. Now I can understand amount of money and prices that cashier tells me, have ability for asking the prices and for finding some products in markets by their names.